One name is synonymous with cotton innovation in the Delta, and that is David Wildy. Six years ago, the Wildy Farm in Manila, Arkansas, was 100% cotton and heavily engaged in on-farm research with the University of Arkansas to generate innovations that drive profitability on the 7,500 acre cotton farm. 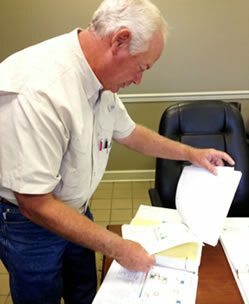 Today, the commitment to innovation and field research is just as strong – as demonstrated by his recent addition of 40 acres for USDA-ARS water research to the 15 acres of University test plots behind the shop – but now, with gyrating commodity prices, Mr. Wildy grows other crops in rotation with cotton. Going from just cotton, to 6,000 acres of corn-soy-milo and 5,000 acres of cotton has put a serious constraint on management time and forced Mr. Wildy to focus on input cost savings and yield. That focus pays significant dividends, especially when commodity prices are low. Mr. Wildy has long been a proponent of precision application. Pix worked perfectly with precision application, but recognizing that his Pix use rates do not impact yield and when generics cut the price, he decided to focus his management time on inputs that cost real dollars: seed, fertilizer, and lime. Each of these inputs cost over $50 per treated acre, so the Wildy farm uses intense soil sampling on every 2.5 acre block to create precise application maps. Since lime, P (phosphorus) and K (potassium) requirements do not change dramatically from year to year, soil samples are pulled on a third of the farm every year covering the entire farm every three years. Mr. Wildy considered using soil zones to cut his sampling costs, but a strange observation with lime requirement in pivot irrigated fields convinced him to stick with 2.5 acre blocks. Despite the best agronomic predictions, the lowest pH was in the dry corners – not under the pivot where more nitrogen and water are applied. The cause for this anomaly turned out to be a good slug of calcium in the pivot water, which saves the lime application on 80% of each pivot-irrigated field. (See photo of a lime prescription map for a pivot field.) Neither does Mr. Wildy give up on low productivity areas; he uses precision application to boost yield in poor spots by applying extra organic matter from chicken litter, cover crops, and his own weed free and disease-free gin trash. With 1 seed per foot costing $250,000 across his farm, prescription seeding maps are established well before planting, based on Veris soil texture, yield history, and irrigation. 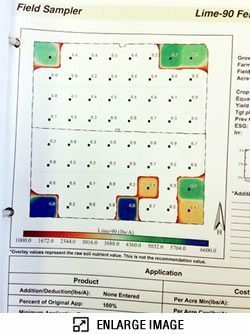 Mr. Wildy creates prescription field maps that call for 2, 3, or 4 seeds per foot of row under favorable planting conditions. The prescription also calls for fewer seeds in the dry corners and sand blows to give each cotton plant a little more soil moisture and to cut input costs where yields are capped. When the planting season arrives, if weather or seedbeds are poor, a simple adjustment ups the seeding rate by 10, 20 or 30 percent, even after the planter has pulled into a field. This allows timely adjustments to field prescriptions even during the busiest season.